This morning a scenic drive leads us to the stunningly beautiful UNESCO World Heritage Site of Halong Bay. Boarding our traditional wooden junk boat we cruise the emerald waters soaking up the panoramic vista of the thousand or so karst limestone islands that stud the bay. Later opt for a refreshing swim in one of the many sheltered coves before taking row boats to the pristine ‘Dark & Bright Lagoon’. Tonight, there’s a Vietnamese cooking demonstration held on the sundeck before an impressive seafood dinner is served. Start the day with a Tai Chi class on the sundeck or a traditional massage. After exploring a lofty grotto hidden beneath towering cliffs, we sail back to port. PM: After lunch proceed to visit the Ethnology Museum (apply on Sun, Tue, Thu & Sat), the Literature Temple and Quoc Tu Giam, see Vietnam’s first university, constructed in 1070 – it’s gardens and well-preserved architecture will offer a relaxing glimpse into Vietnam’s past. Take you past Hoan Kiem Lake to see the peaceful waters, and the beauty of Ngoc Son temple. Tour ends around 15h30 – 16h00. 8:30 Our guide & driver will pick you up at your hotel in Ha Noi Old Quater, then leave by coach to Hoa Lu (2.5 hrs). Visit the historic capital of Viet Nam and the famous ancient temples of Le and the Dinh Dynasties. Enjoy buffet lunch at local restaurant then. After lunch, boat trip to visit Tam Coc to see the beauty of the karst formations as you pass along their base and row into one of the many caves carved through the limestone. 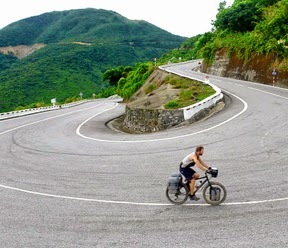 Then, cycle for an hour on quiet roads through villages, rice fields, rivers and rocky outcrops in Tam Coc – Bich Dong (around 4 km). Drive back to Ha Noi and drop off at your hotel around at 6:30pm.